In Dan Abnett's Rebirth Aquaman Vol. 1: The Drowning, he walks back what I thought was some of his major progress in Aquaman Vol. 8: Out of Darkness. That's a shame, and I do question some of Abnett's choices here, but in my opinion so far Aquaman is the best of the Rebirth debuts. Drowning is political and multi-faceted without lacking for superhero slugfests, and it reminds strongly in this way of Greg Rucka's original Wonder Woman -- high praise indeed. In all I've liked Abnett's Aquaman much more than I thought I would, and reading the next volume is a foregone conclusion. There's an astounding amount going on in The Drowning -- first, Black Manta blowing up the Atlantean Spindrift Station embassy, and then quite separately Atlantean terrorists attacking a US ship just as Aquaman pleads with the White House to reopen the embassy, and then Atlanteans guards getting caught investigating the incident by the US military, leading to Aquaman's incarceration. The big events -- plus Mera breaking Aquaman out of holding and a fight with Superman -- are in some respects unrelated, but cascade to create a particularly bad day for Aquaman and his Atlantean political cause. From the very first explosion, blowing out a side of Spindrift Station, Abnett's Aquaman put me in mind of Star Trek: Deep Space Nine, for the importance of the locale and also for the sci-fi politics and the troubled attempts by different cultures to coexist. Spindrift itself departs the story surprisingly early and I'm not sure if it's coming back, but Abnett keeps up the intrigue throughout. There are so many smart facets to this -- that Aquaman is willing to be detained (despite that he could break out at any moment) to show his deference to the US government, even as the Atlantean people behind him only become more militant with Aquaman's detention. And as with any good sci-fi, Abnett's story is a metaphor for real-life events, as Aquaman begs the US government not to judge his entire people by the actions of a few Atlantean "domestic terrorists" or "survivalists." Though Drowning is enjoyable overall -- again, one of Rebirth's best so far -- it is problematic that the book must (maybe necessarily) turn on some seemingly forced naivete. The President's chief of staff here is obstructionist to the point of unbelievability (or is it?). Further, I had considerable trouble with Abnett's Mera. That Mera is flighty and blase about "surface" concerns is not wholly incompatible with her character, but as recently as Abnett's Aquaman Vol. 8: Out of Darkness, we seemed to have seen Mera growing into and succeeding in the role of Atlantean diplomat. That she turns away from that here, even denigrating the Aquawoman persona she just took on (to good effect, I thought) seems a regression for the character. It's also troublesome that Drowning ends up another story where the male hero's trying to do what's right and his girlfriend just can't understand (including breaking into Aquaman's prison cell and making the situation worse). Mera's apparent about-face almost makes me wonder if there isn't more at play, as if perhaps someone decided the green-suited Mera better matches the Aquaman characters' upcoming movie presentation than Aquawoman does. As complicated as Drowing gets by the end, it's easy to overlook the first two issues' straightforward (but no less riveting) Aquaman/Black Manta fight. We've not actually seen Aquaman and Manta face off for six collections and three years now, and that "first" New 52 time was when we learned that Aquaman mistakenly murdered Manta's father. Abnett brings a lot of strong emotion to the fight, with conversation on par with the best of Geoff Johns writing Green Lantern Hal Jordan and Sinestro. In stark terms, Abnett's Aquaman describes how neither Aquaman killing Manta nor Manta killing Aquaman would slake Manta's vengeance. Aquaman's dialogue -- "I miss my father every day. I'm sorry I took yours from you." -- is both touching and has been a long time coming. Due presumably to Aquaman shipping twice monthly, the book has a rotating team of regular artists that includes Scot Eaton, Brad Walker, and Philippe Briones. 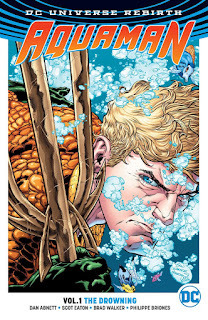 Admittedly part of what made me hesitant for how the Rebirth Aquaman would turn out was previews of Walker's art, with some extreme facial closeups and a tendency for Aquaman's hair to make him look square-headed. But in final tally Abnett's story is strong enough to overcome any slight artistic hurdles, and all of the artists styles do resemble one another, making for a better reading experience than one might expect from three different artists. And Walker's art has grown on me; the sketchbook in the back demonstrates especially how Walker gives both Aquaman and Mera more realistic proportions -- including actual hips and thighs! -- which is a nice change of pace. Even as I'm not sure Dan Abnett gets Mera quite right in Aquaman Vol. 1: The Drowning (last time around, I thought his version could hold her own series, but now I'm not so sure), Abnett's overall Aquaman package is bar none. It's a rare comic that spends an issue with the title hero debating policy in the White House while other characters fight the battles, and that's an indication of the Rebirth Aquaman title's specialness. From the second volume, I'm hoping for just more of the same. I'm glad you liked it! Aquaman was definitely a favorite of mine coming out of Rebirth, and what really drew me in issue after issue were the surprises of Aquaman being a King, and trying to actually hold peace and do what he can to prevent all out war. The issues that follow uphold the same quality? yes! Aquaman goes to the top of my read pile each release. It gets even better. I hope Abnett stays on Aquaman for a long time. Under him, I feel like the book's finally living up to its epic potential that Johns's run barely hinted at. I don't think anyone can read this book and not come away convinced that Aquaman is a major player in the DCU. And since I thought the orange/green color scheme clashed terribly with Mera's red hair, I'm glad they dropped the Aquawoman idea. Aesthetics aside, I thought Mera finally embracing the Aquawoman identity was a good culmination of her arc from start to finish of the New 52 series (and even going back to Brightest Day, etc.). That she backs off it, and then essentially starts or worsens the conflict between the US and Atlantis, seemed a regression for the character and not necessarily a logical one, either. That said, a good writer can get away with a lot, and Abnett embeds that with so much other good stuff that I'm willing to go along for the ride. Aquaman feels like one of the few books (outside of Bunn's run) that keeps building off what writers before set up, instead of starting over with a clean slate. Abnett's run reads like a proper follow-up to what Johns and Parker wrote. Agreed. I might say Green Lantern has that vibe, too, though I'm not completely caught up.